I’ve been meaning to write some kind of a review for Superman Returns or Pirates of the Carribean, but I’ve seen so many posts wondering how in the world the Man of STEEL screwed Lois Lane (oh, that’s a spoiler hehe) and how utterly repressed Elizabeth was in Pirates, that I decided I didn’t want to jump in the bandwagon and just abandoned the idea. So there. I’m just going to talk about my new plant. Without Marc knowing (he only found out AFTER I bought it hehe), I got me a cute bamboo plant. A real, live one. Between you and me, I think the main reason why I bought this was because of the water gel’s color. I really, really liked the color, and thought it could liven up my computer work area. Marc wasn’t too happy about my purchase, for the simple reason that I’ll eventually kill it. Ah, well. Time will tell. When it dies, he’ll be the first to know. Besides, it WILL eventually die, you know. The plant will probably just die before it’s expected life span, but who knows? I might have gotten a bit of my late grandma’s talent for gardening (eventhough this thing can probably live without me intervening too much). I remember that the only plant I’ve managed to sustain for some time was a monggo plant… And I didn’t even mean for it to live, it was really an accident. I bought some monggo seeds for a school art project, and left the extras on my desk. I must have spilled water on them or something, because the next thing I knew, there was a greeny growth on my desk near the window. Since it was alive anyway, I just watered it when I had the chance (well, monggo plants are kind of low maintainance, aren’t they?). I haven’t really had the best of luck maintaining live stuff on my desk… I was so bad, I even killed my colony of sea monkeys (what are those friggin’ things, anyway?) I bought from HongKong with grandma. Well…. Let’s hope for the best for my bamboo plant, shall we? 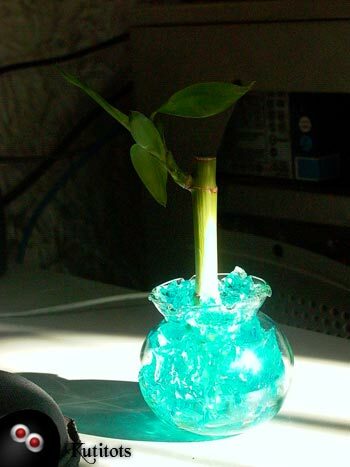 Anybody out there who knows how to take care of a bamboo plant? Tips will be much appreciated. I think I’ve been so happy having plants in my work area that I let mushrooms grow on the edge of my door hehe. Don’t ask me how they got there… I don’t know how. Probably because the door’s edge gets wet frequently? Oh, well. I think I’ll be seeing a lot of these during this rainy season. This entry was posted on Wednesday, 19 July 2006 at 8:08 am and is filed under Random Thoughts. 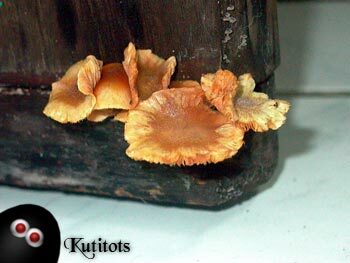 hey, are those kabutes Ganoderma???? hahaha!!! gulat kayo no? have nice and fun day!!!! massalam! mashallah! enta fi katir yom kwais! DONZ: No, really, they’re not poisonous? Shet. 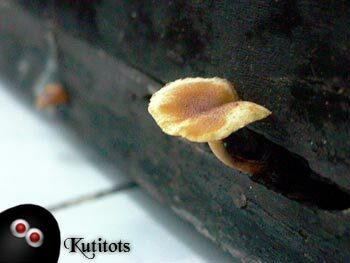 Pinaglaruan kasi ng little Choknat ko yung mushroom kanina 🙁 My dad said that if Choknat dies, the mushroom is poisonous! Syempre no ayoko na intayin yun diba??? I thought kaya yellow sya dahil sa weewee ng doggies na napupunta sa dulo ng door hehehehehe OR ganun ba talaga yun? There may be dwende-kutitots living there!! !